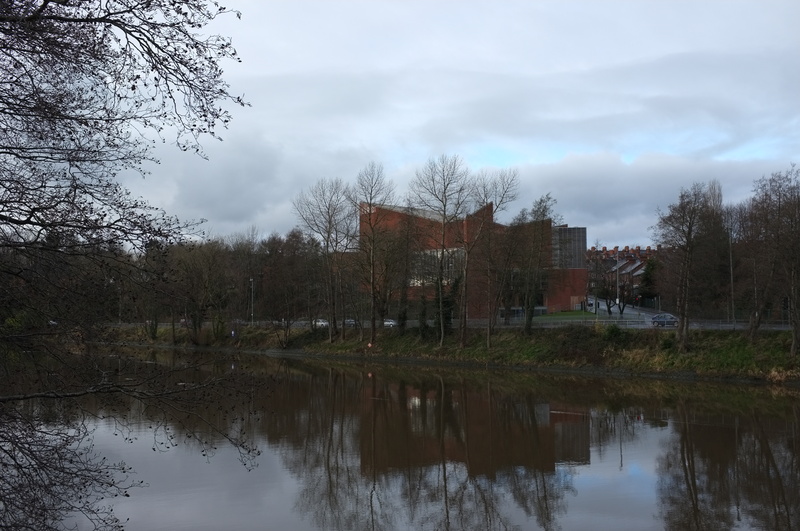 The building is located in Stranmillis, a residential area to the South of the city centre, on the banks of the River Lagan. 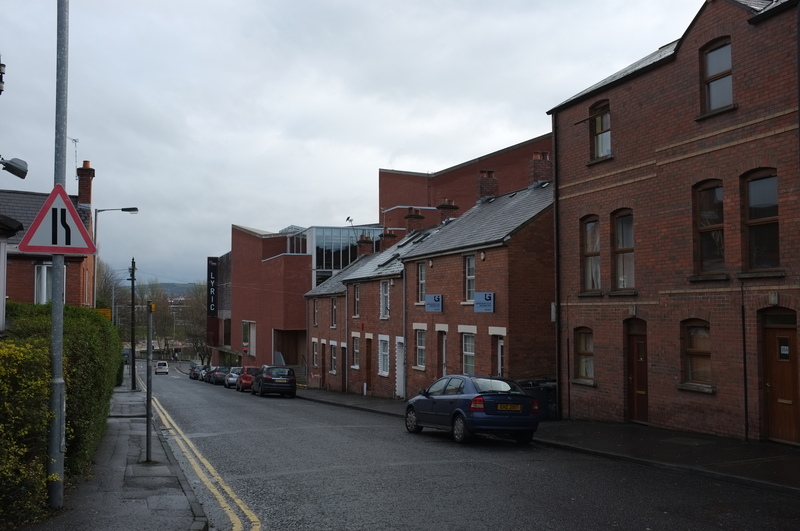 O’Donnell Tuomey have taken full advantage of the steeply sloping site – allowing the building to relate to the residential scale of the surrounding terraced housing, while presenting a suitably impressive civic frontage to the riverside and main road. 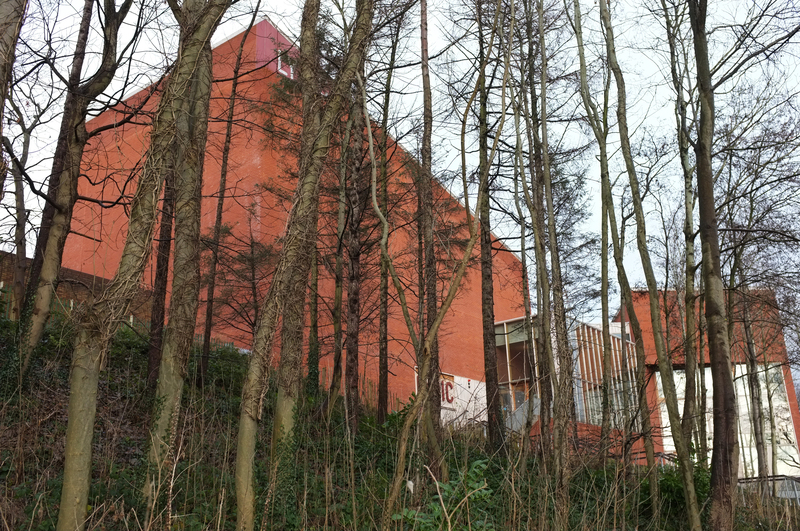 The building is clad in the ubiquitous red brick of the surrounding terraces. This brick is also present internally, framed by the expressed concrete floor plates. The ‘Front-of-House’ or Public areas are arranged around a terraced and meandering lobby space, crowned by an atrium which cuts through the ‘Back-of-House’ areas above. Simple wooden balustrades line corridors to the offices and rehearsal spaces that overlook the entrance lobby. The reception area and grand central stair are clad in natural stone, similar in tone to the concrete, with an intricate but robust painted steel and wooden balustrade. A Cafe and Bar are located at the halfway point of the meandering lobby, and benefit from fantastic views across the river. Here the red-brick has been used as a robust floor covering, with a beautiful (but potentially impractical) in-situ concrete bar / servery. At the summit you reach the theatre lobby, a dramatic double-height space with theatrical lighting and full height glazing to the riverside. 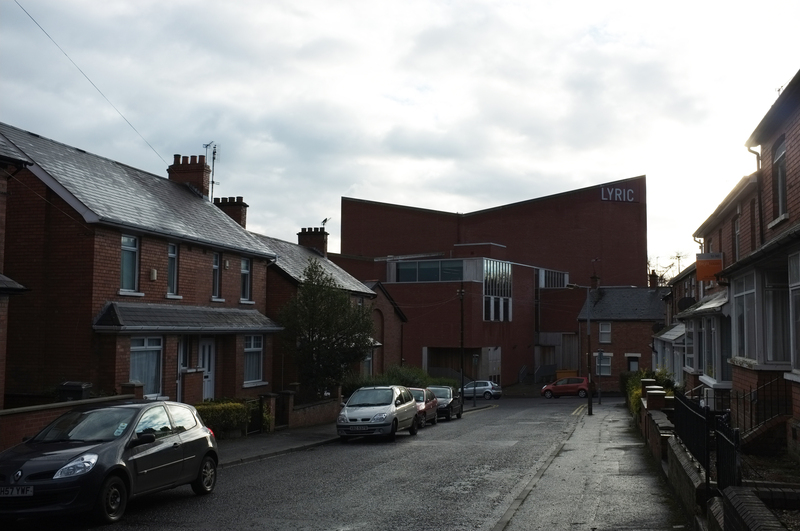 The link below will lead you to some glossier images of the Lyric, including some photographs of the beautifully crafted auditorium. http://www.dezeen.com/2012/07/25/lyric-theatre-by-odonnell-tuomey/ On my next visit, I hope to enjoy a performance! As a child I visited the former 60’s built Lyric, which stood on the same site. There was always a great atmosphere – created in part by the compressed scale – the audience was almost on top of the players. When John Tuomey described the space during the RIBA Sterling Prize debate he mentioned this quality and described the pains that had been taken to recapture it in the new building – I am curious to find out if they have managed it! 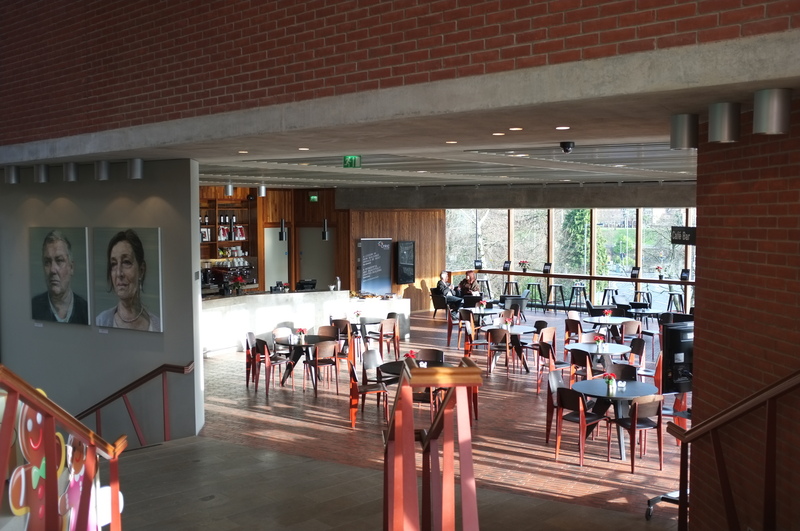 When i first showed the pictures to Sigrun, she remarked that the interior has the crafted but practical feel of the 70’s public architecture of Scandinavia. 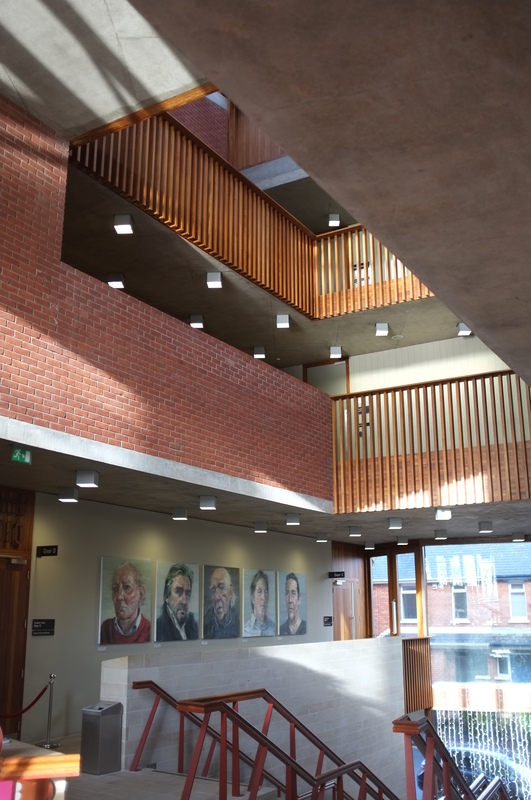 For me the generosity and transparency of the terraced public lobby is reminiscent of the Royal Festival Hall in London – one of my favourite public spaces this side of the Irish Sea. More on The Lyric is an excellent first post for the new year. Great to see more of it! It really sits well in its surroundings. The material palette made me think of Sigurd Lewerentz St. Marks church, which is still fresh in my mind. We’ve had a bit of a break from writing because of a joint venture on a competition; http://iaccincinnati.com/, crossing our finger and toes for that one… We’re happy with the result and excited to work on an area like the Over-the-Rhine, Ohio. We discovered a place – with the help of the resources given and tools such as google maps/earth and bing maps – full of potential and with a great cultural/historical landscape. It was great to put into practice what we have been writing and thinking about recently. We look forward to sharing our design as soon as the results have been announced.